The bar with a tongue in cheek name sells a selection of themed merchandise. It is one of the most popular places in the area to grab a pint of Guinness. The gold and black colour scheme gives the pub exterior a distinctive Edwardian look. The bar is tied to some of the great historical events of Dublin. Michael Collins drank in this very pub while evading forces that were occupying Ireland at the time. Reviews from numerous sources have lauded the bar for how friendly the staff are. This is the kind of service you want from a pub in Dublin. The atmosphere is known to be welcoming and jovial. It is not uncommon for revellers to sing a song with strangers. It has been likened to having a drink in a friendly neighbours living room. There is an upstairs seating area. Up here customers can watch the latest live rugby matches. This makes the pub ideal for those who want to watch the game with friends while having a drink. The venue is quite homely and less touristy than some areas. For this reason it is the perfect spot to visit a true local Irish pub. They have live musical events within the bar during some evenings. These include traditional Irish folk bands. 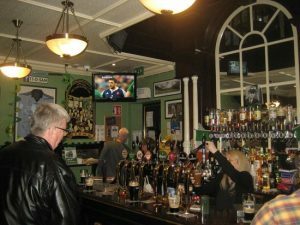 Tourist guides have stated that this is one of the best places in Dublin to drink a pint of Guinness. The place is a hidden gem within the city. The prices are cheap compared to the more often visited Temple Bar area. When you visit you will be interacting with locals from the area. This will give you a better idea and understanding of what Ireland is truly like. You may even make some new friends along the way.